Hurray! New year, new blind tasting session. As usual Jean-Marie Putz of Whisky-distilleries.info proposed six unnamed samples on a stunning box like previous tastings. A blind tasting is a quite interesting experience because tasting whiskies in this way you really pay more attention to the whisky and less to the bottle. I have tasted whiskies that I have considered good but nothing special ( Is there such a thing as bad whisky?! ) and then I discovered that I were tasting a 39 years old single malt. Have I known before hand what I was tasting I am 100% sure it would have affected my rating. Nose (86): more than average. fruits, apples, cinnamon, wood, honey, citrus. It is a fruity dram with a young character. Finish (87): longer than average. wood, honey, cocoa. So based on other whiskies I have already tasted I rate this The Glenrothes 1998 Wlson & Morgan Marsala Finish with 87 points over 100. Nose (87): average. honey, citrus, floral, vanilla, apricot. Palate (88): powerful, oily. honey, mango, citrus, floral, vanilla, spices. Finish (88): longer than average. honey, spices, mango. So based on other whiskies I have already tasted I rate this Aberlour 17 Year Old - Single Cask (Master of Malt) with 88 points over 100. Nose (89): more than average. honey, vanilla, citrus, spices. Lots of honey and vanilla, It is really familiar... umm... maybe Springbank? Palate (87): powerful, oily. honey, wood, spices, citrus, cardboard. Too woody. So based on other whiskies I have already tasted I rate this Glen Garioch 21 Year Old Single Cask (Master of Malt) with 88 points over 100. Nose (91): more than average. honey, nuts, citrus, floral. Good sherry! Aye! Palate (90): powerful, oily. nuts, honey, citrus, wood, spices, herbs. Quite a lot of sherry here! Finish (90): longer than average. nuts, wood, honey. So based on other whiskies I have already tasted I rate this Glen Scotia 19 year Silver Seal with 90 points over 100. Nose (91): more than average. honey, nuts, citrus, cinnamon. Smells slightly younger than sample 4. Maybe 10-15 years old? Palate (90): powerful, oily. honey, nuts, wood, citrus, floral, cocoa. Finish (90): longer than average. honey, citrus, wood. So based on other whiskies I have already tasted I rate this Glen Scotia Twenty Wilson & Morgan with 90 points over 100. Nose (89): more than average. honey, citrus, wood, vanilla, spices, flowers. Maybe 20 years old whisky? Palate (90): powerful, oily. honey, citrus, floral, spices, vanilla, wood. Finish (91): longer than average. spices, honey, vanilla. So based on other whiskies I have already tasted I rate this Allt-a-Bhainne 1992 Malts of Scotland with 90 points over 100. Three clear favorites, the two Glen Scotia drams and the Allt � Bhainne. The two Glen Scotia are delightful sherried whiskies, just after tasting for weeks only bourbon casks I was in need, desperately I would say, of something more sherried. As I said above, it is hard to choose one over the other. The WTS-2013-05, the Glen Scotia of 20 years old works slightly better for my palate. 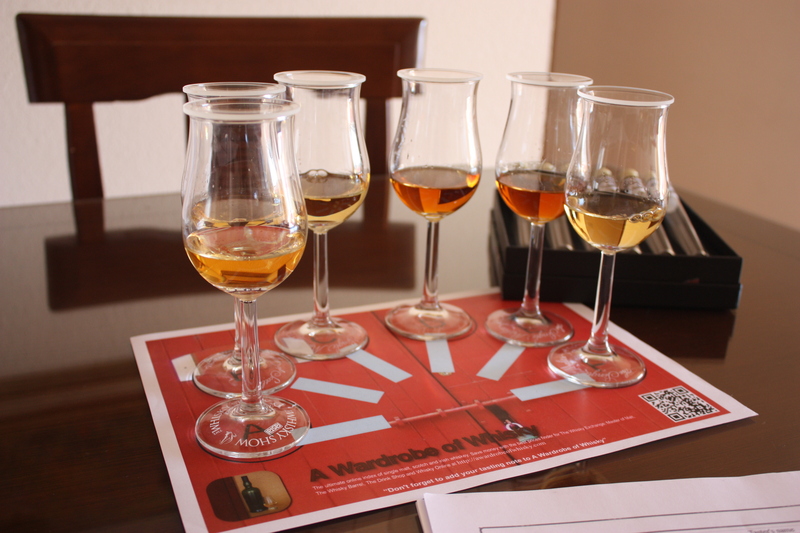 My samples of Whisky Tasting Sessions 2013-02 are now on the way! Stay tunned.